As I was scrolling through my e-mails earlier today, I saw an announcement about the DDPRadio show topic for the night. 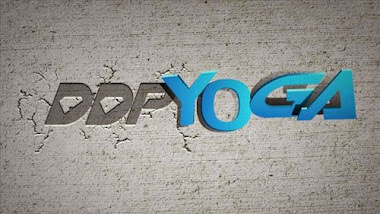 (For those of you unfamiliar, I practice DDPYOGA and the DDPYOGA program was the catalyst for the beginning of my real journey toward good health. Hence the subtitle of my blog, "A New Me Via DDP.") The topic for tonight's show was to center around your "A-HA Moments": you know those metal pans to the head moments where your next step becomes so clear and you figure out the route for the next leg of your journey. Well, my A-HA moment for me was simple in the beginning. I saw that video millions of us have seen about a Veteran named Arthur who was crippled and began following DDP's program and saw miraculous changes. That moment, those few minutes, were everything I needed in order to understand what I needed to do to own my health again. And boy howdy did I ever run with it! I ran hard and I ran fast! I began DDPYOGA in January of 2013. I did a lot of cleaning up in my diet and I worked out like a maniac. I saw immediate results and they were good ones. And I was happy. By my fourth month in, I was down 40 pounds; off one of my blood pressure medications; and my overall PsA symptoms seemingly were improving. Just a few months later, however, the weight loss had stalled and I hit a brick wall. I was so angry, frustrated, tired and bewildered. I was working so hard to make so many positive changes and there I was. Face meet wall. It wasn't the first time such a thing had happened. I had hit those brick walls before. There was one significant difference this time; with this particular wall. Rather than say screw it and throw in the towel, I didn't. Well, not completely. I did gain back a lot of the wait I had lost. However, I didn't gain back all forty pounds and some additional. While I began making some poor food choices, they weren't all bad and I was still making better choices than I had been making before. For the first time, I hit a brick wall, caved a bit, but ultimately kept searching for a way through it or around it or over it. Despite all of the obvious setbacks, I was still trying to inch my way forward literally one minute and one inch at a time. It took about a year of this brick wall struggle to realize I was really going to have to figure out what the extra key was for me. I firmly felt the AI diseases were the reason I had to find that extra key. I had to have an addition to my DDP Program to get me well. DDPYoga was obviously a keeper as was the clean eating. What else was there? Hmm. Well, there were my many illnesses and the many treatments I had to receive to survive the illnesses. I was not upset I was taking medication to remain functional, but I was upset that there appeared to be no end to the medications and no being funcational without them. I began following Brenda Nair's fight against breast cancer in 2014. Brenda made the very personal decision to fight her cancer in as natural a way as possible. She amazingly and bravely decided to heal herself with as few drugs as possible and focused rather on detoxing her body and healing through food choices, etc. Why my A-HA moment didn't immediately hit me over the head with that proverbial frying pan is beyond me. Maybe because I wasn't ready to full accept that might be what I needed to do for myself. Who knows! But I did begin researching natural options to assist in my health recovery in 2014. I wanted to find out if there were thoughts or ideas out there surrounding the healing/treating/curing Auto Immune Disease in natural ways. And so I searched. And that's how I found my way to TrueNorth. And that's why I'm at TrueNorth now. The point in all of this rambling is this: Were it not for DDPYOGA, DDP, Brenda Nair, Arthur Boorman, Stacey Morris, etc., and that FIRST A-HA moment, I'd still be back there struggling somewhere at the starting line. And while it's taken me a little over two years to crawl to this point, there's some pretty awesome things going on in my life at this point. - I'd weigh at least 42.2 pounds more than I did when I began DDPYOGA in January of 2013. - I'd still be taking 11 different medications. - I'd still be addicted to nicotine and caffiene. - I'd still have blood pressure approaching critical points even with medication. - I'd still be lost and struggling to find a way to get my health back. We all have choices on what we can do to get our health back. I've chosen DDPYOGA and TrueNorth Health Center. These are my two big tools to get me where I need to go. You may like one, both or neither and that's okay. I'm not here to tell you what to choose. I'm here to tell you my experinces and my journey and let you know what has helped me. If these things can help you, that's great. If it needs to be something else, that's fine, too. The point is: you need to find your A-HA moment andmake it mean something. Every day you spend in misery is a day you won't get back. It's just lost. But there's no point dwelling on what's gone. Focus on what is yet to come. A-HA. See. It's not too late. ♡♡ BEST blog to date! !